Established in 1997, Emaar Properties has singled handily transformed Dubai skyline and residential landscape. Selling over 90,000 properties sold since its inception, Emaar is behind some of not only Dubai’s but also the world’s most iconic buildings; the Burj Khalifa and Burj Al Arab to name a few. Along with world record-breaking structures Emaar has also built a number of world-class communities including Downtown Dubai, Dubai Marina, and its most famous villa community; Arabian Ranches. So, with so much already done what's next for this giant developer? Let’s have a look at some of the new and exciting Emaar Properties developments coming soon. Set to become the new center of Dubai, Dubai Creek Harbour is a revolutionary new age project situated in the historic Dubai Creek. Featuring a total of nine distinct districts set over a land area over 6 square kilometers Dubai Creek truly is, a mega project. This focal point and biggest attraction at Dubai Creek will the world record-breaking Dubai Creek Tower. 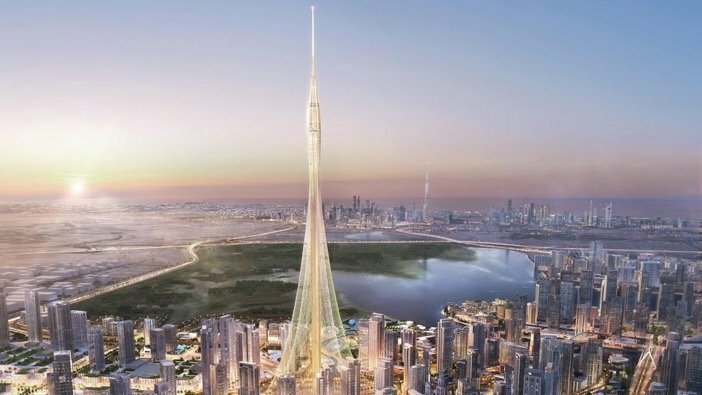 With a height of over 1000 meters it is set to become the world tallest structure and with that become a massive tourist attraction for not only Dubai Creek but also Dubai. Designed by world-renowned Spanish architect, Santiago Calatrava, this iconic structure is set to feature numerous observation decks offering unrivaled 360 Degree views of Dubai and beyond. Outside of being home to the world tallest structure, the Dubai Creek will also host the world’s largest shopping mall; Dubai Square. This revolutionary retail and entertainment project will offer over 8million sq. ft. of retail space equivalent to more than 100 football fields. This will make it almost double the size of Dubai Mall, currently the world’s biggest. Split across three levels, Dubai Square will feature one of the world’s largest Chinatown communities as well as an events arena and a host of luxury retail, dining and leisure outlets. Outside of just retail and entertainment options, Dubai Square will have a purposeful “tech-driven” focus offering customers a way of shopping that’s not been seen before. Significant new real estate projects at Dubai Creek Harbor include The Grand, The Address and Breeze. Nested in between Dubai Marina and the Palm Jumeirah, Emaar Beachfront is Emaar’s first ever beach front community. Inspired by the world famous south beach Miami skyline, Emaar Beachfront delivers the best of beachside living amidst the exclusivity of a private island residence. Designed to bring the convenience of urban living within a first-class beachfront setting, this resort-style community will feature a total of 27 towers. These will be made up of predominantly residential with some hotel towers included. Positioned in a pristine location, Emaar Beachfront residents will have direct access to 1.5km of white-sand beach along with direct access to a new Marina. All apartments at the Emaar Beachfront project will feature high-end interiors and floor-to-ceiling windows capturing stunning views of either the Dubai Marina Skyline or Palm Jumeirah. Along with amazing views, residents will also enjoy world-class building amenities as well as easy access to a host of entertainment, leisure, and retail outlets. As of Q4 2018, there has been a total of three projects launched at Emaar Beachfront. The first of these was Beach Vista which sold in under 48 hours followed by Sunrise Bay and Marina Vista. Considering the successful sales of each, the next phase of projects to be released is expected in early 2019.